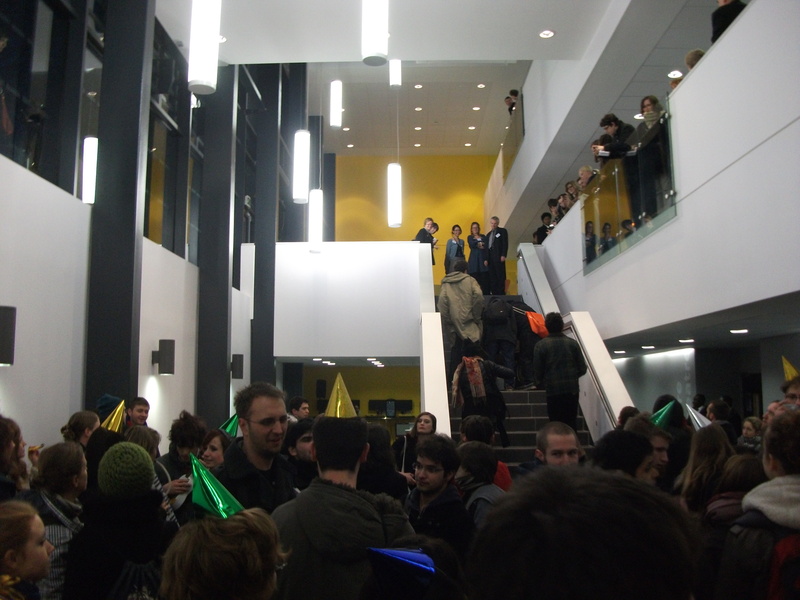 On the night of 22nd February 2011 Goldsmiths decided to hold an invite-only celebratory opening of the ‘New Academic Building’. 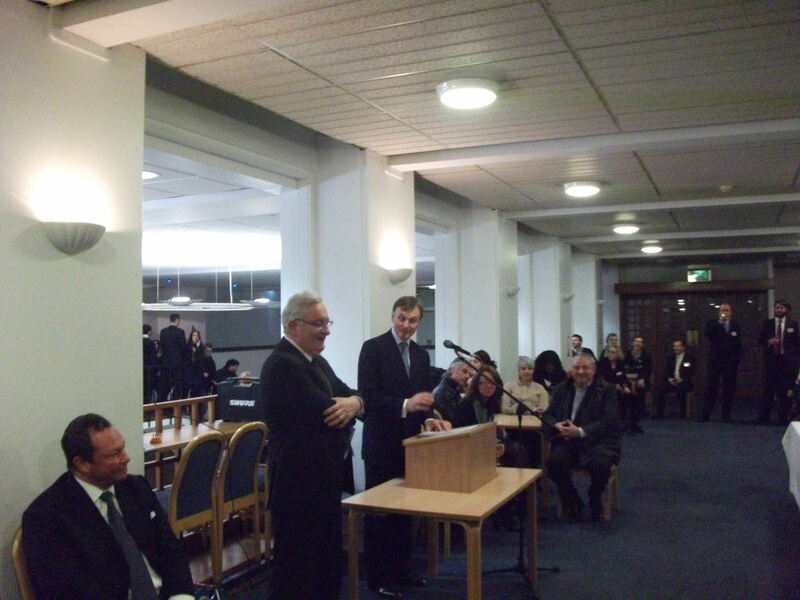 Archie Norman, former Tory MP, private equity and business management champ and current chairman of ITV was invited. 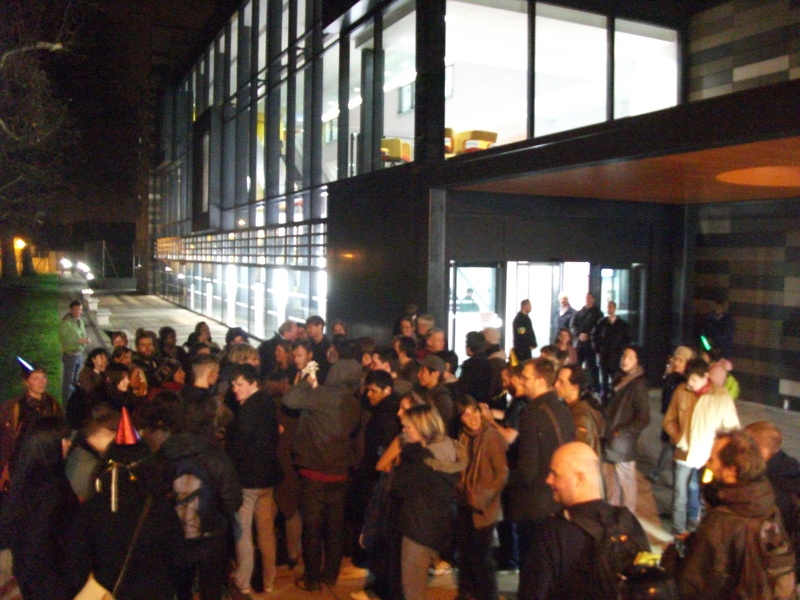 Goldsmiths students were enraged at this measure of transforming a new building being opened at a radical and independent college into a corporate shindig, and decided to hold their own celebratory party. Below are simulations of the event taken for entertainment purposes only by an eye-witness. 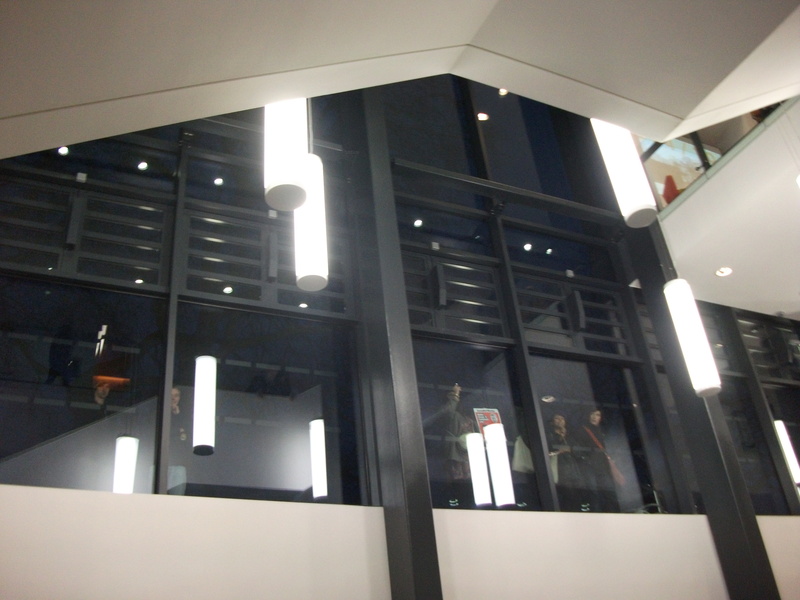 The New Academic Building has been open for quite some time, though Archie Norman had been invited to formally open it. 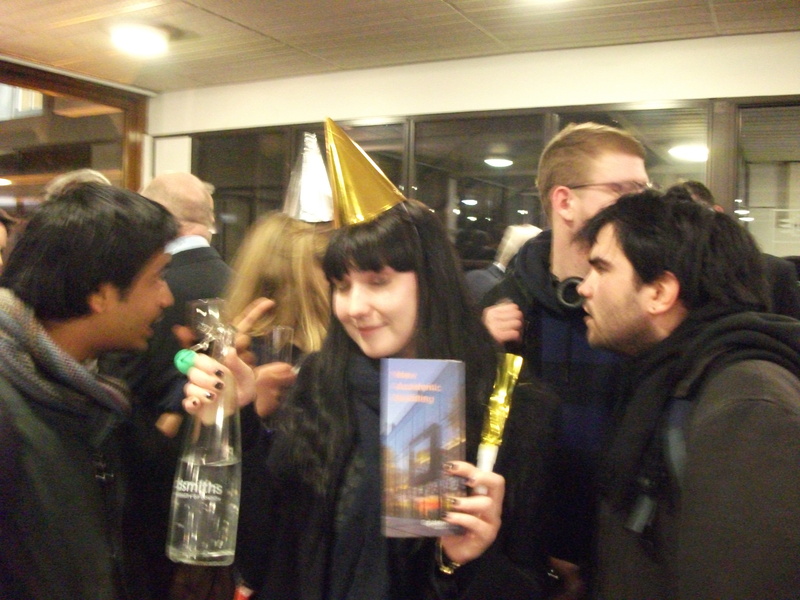 After gathering outside with fake champagne, party horns, hats and streamers, the Goldsmiths crew erupted into the building. 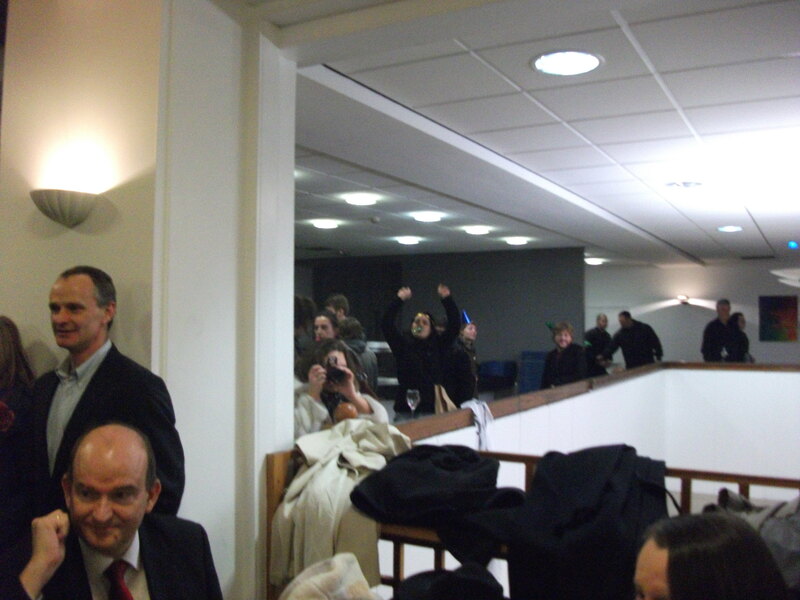 They took over the downstairs area with plenty of support from outside. Students liberated the bottles of wine, water and crap squash from generally amused staff whilst a corporate good-times band were instructed by the would-be revolutionaries to play strictly funk. A scuffle broke out between a good man from the catering staff and a guy who should’ve known better. 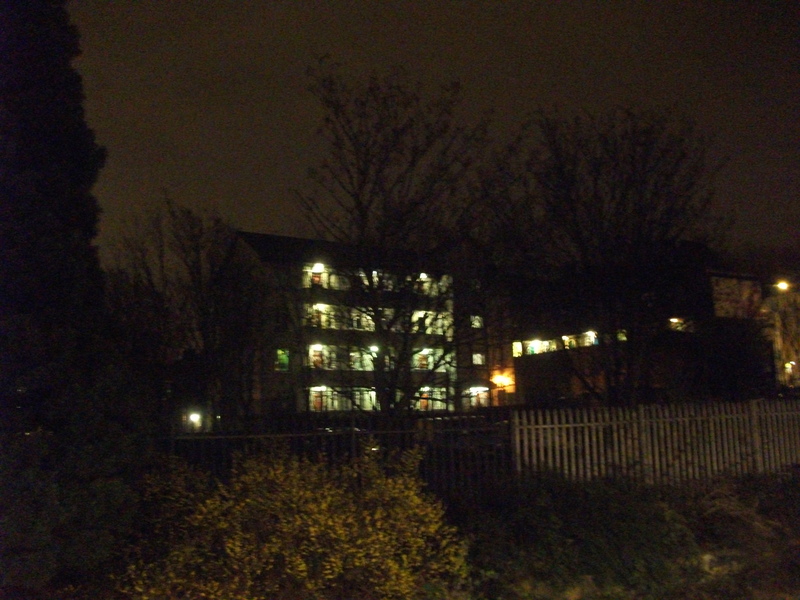 Most of the building was taken over, with bemused guests looking on. 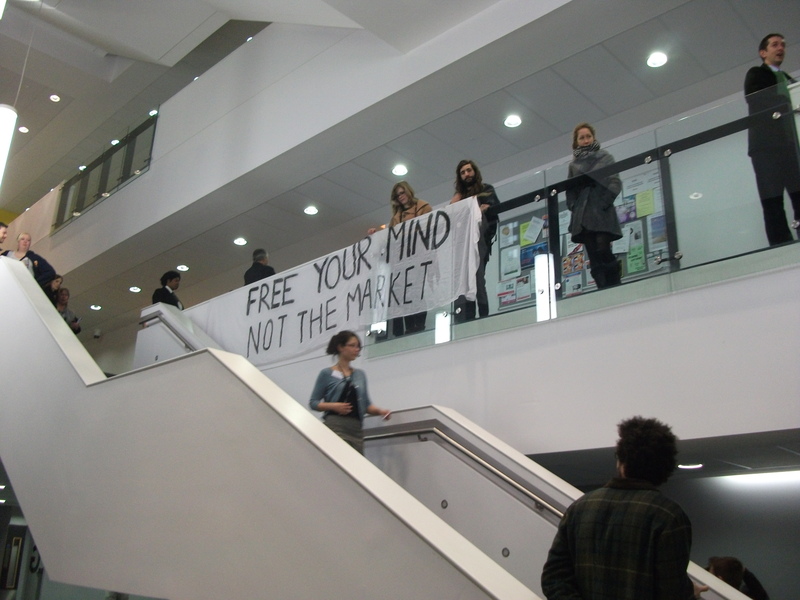 A few teaching staff attempted to patronise the students – generally the academic staff failed to think about why the students didn’t want a higher education system directed by the extremely wealthy with no critical independence. The danger of corporate interests sponsoring and determining how higher education is funded is that certain subjects will always be deemed more ‘competitive’ and quantifiable. Consider what are called the ‘STEM’ subjects celebrated by BP Chairman Lord Browne in his report – Science, Technology, Engineering and Mathematics. Although sometimes crucial to state infrastructure, there are enough global graduates emerging from these competitive fields, and the UK is already over-represented by graduates in these areas. Furthermore, making these areas a priority at the expense of others is naive, for whilst many thrive on corporate sponsorship, many are already in serious problems as a result of research cuts – consider the severely debilitating reduction in neuroscience research in the UK. The danger is that less profitable subjects like the humanities, social sciences and the arts, those which produce and maintain so much of our cultural life, will be forced into further decline and into the hobby subjects of international students and the rich. There is not enough space here to demonstrate the desperate need for cultural production and reflection in English society which is suffering from some serious neuroses, though in hindsight the protesters could’ve done much more (and much more intellectually) to make their cause and concerns known. But, returning to the teachers – perhaps on their part this is a product of years of extreme fatalism, submission and resignation caused by increasing administration and self-auditing, as well as the mood of mass redundancies and the condescending language of the Browne Report of 2010. But on the whole the mood was peaceful and laid-back at the NAB. 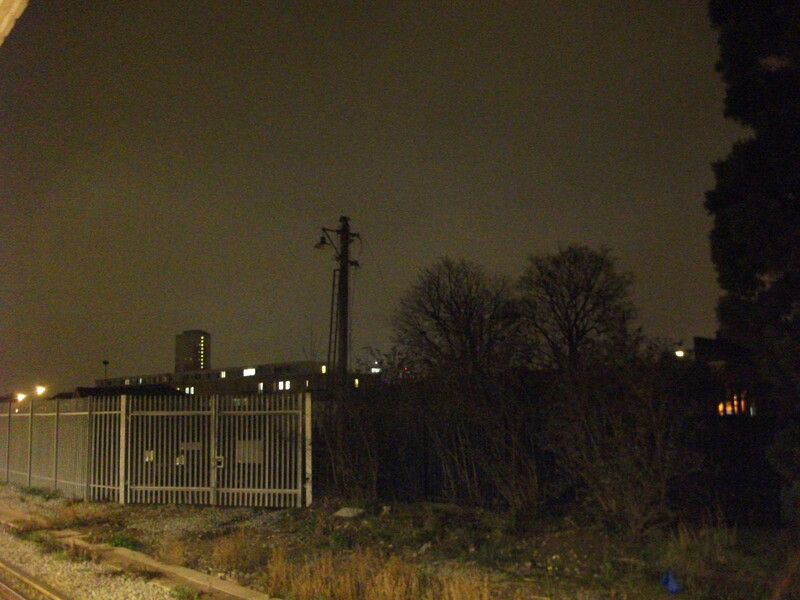 The security staff largely found it funny, not quite as lairy as your average Wednesday cheap drinks SU club night. 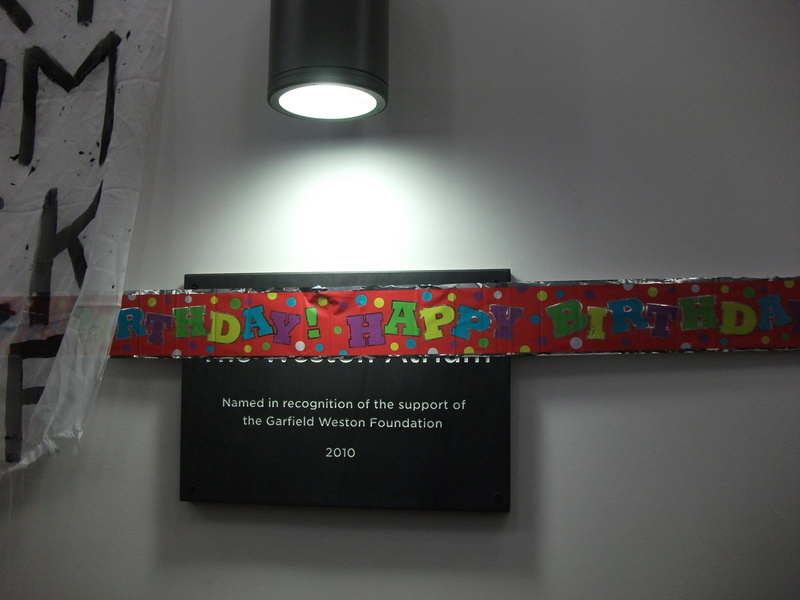 Happy birthday New Academic Building! And what future we might have for you…? We skip ahead in time. A few members of our number of profoundly suspicious nature feared the party was being moved elsewhere. 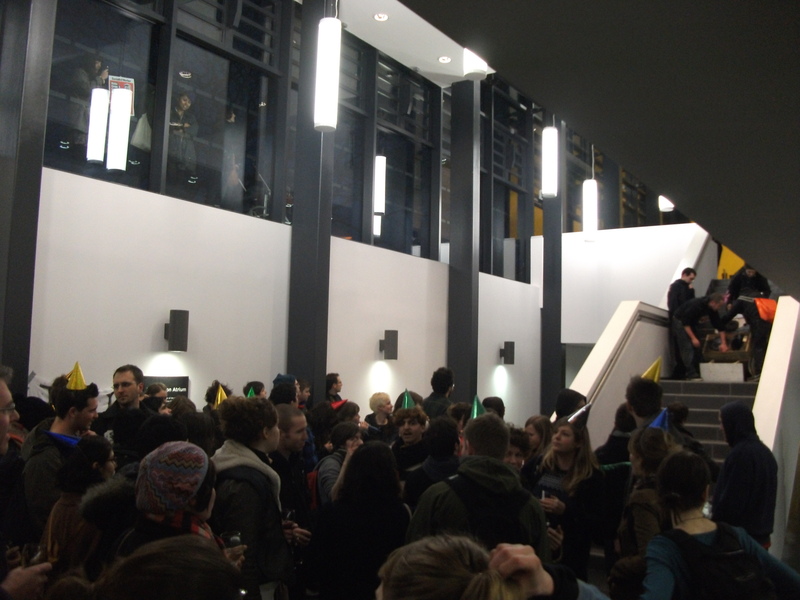 Aghast at the prospect of their peers missing out on the fun times, they traced the opening do now relocated to a totally irrelevant part of Goldsmiths. 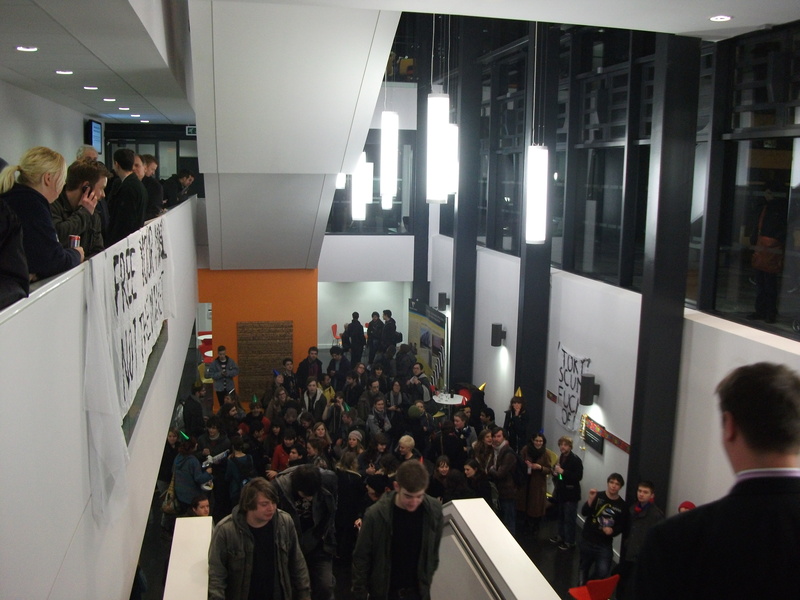 The students managed to break in and bring Archie Norman’s speech to a halt, perhaps to the relief of his guests, pictured below. Yawn! In the new education market, famished interns and semi-employed PhD academic staff rely on these occasions for the free wine and networking opportunities. 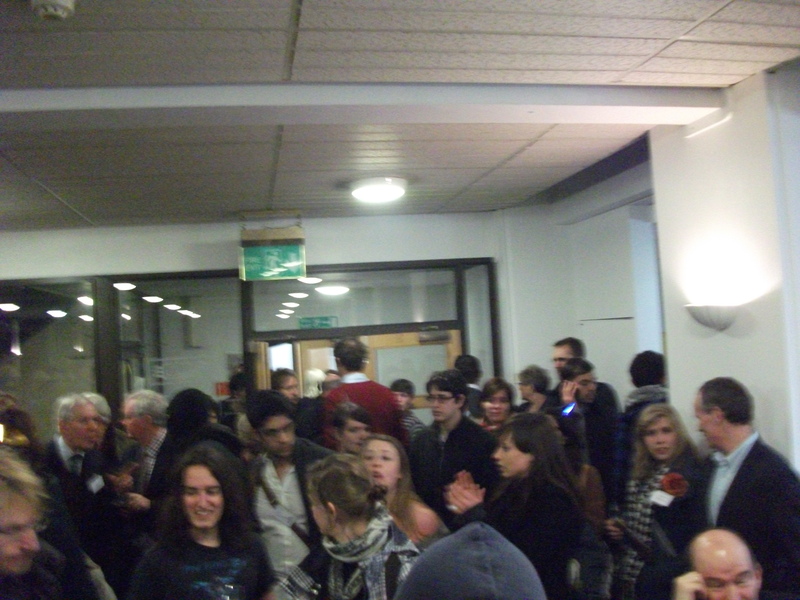 Bit of music and student disgruntlement. Archie gave up after a rowdy youth stole his speech notes. 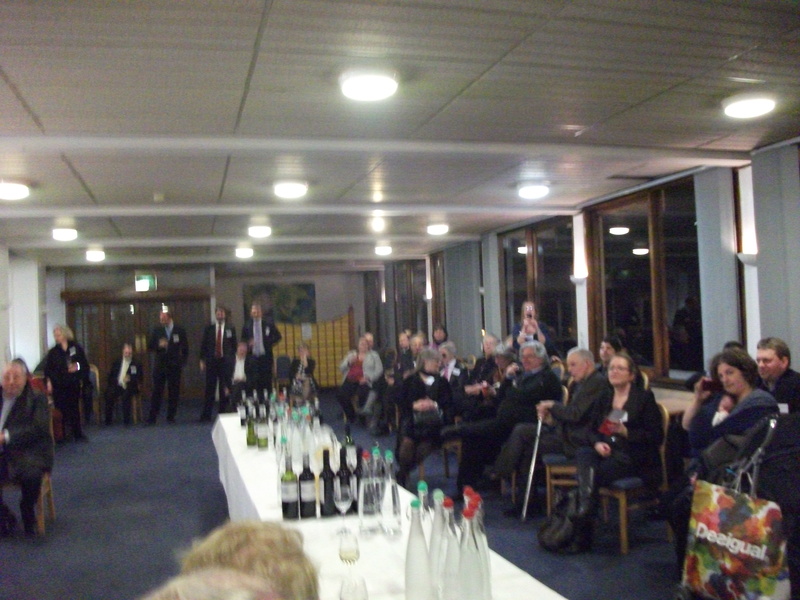 Most of the guests were a bit amused, and everyone helped themselves to wine. I have been very fortunate to receive financial backing from Goldsmiths, though at the same time this has been based on my work merit and involved enough college promotion in turn (check out the History dept page). At the event I was warned in unspecific terms that I’d be in trouble for my involvement, perhaps potentially losing my funding or my place altogether – you can read my apology to a good man who has overseen my most recent grants here: https://docs.google.com/document/d/1Q_pR6v5RY6WiBtEd1NtWA_UpZas7ujMCrHvtITLo3fI/edit?hl=en (copy and paste into your browser). It aims to explain the reasons for the protest, so check it out if you’re still confused as to why the event was disrupted. 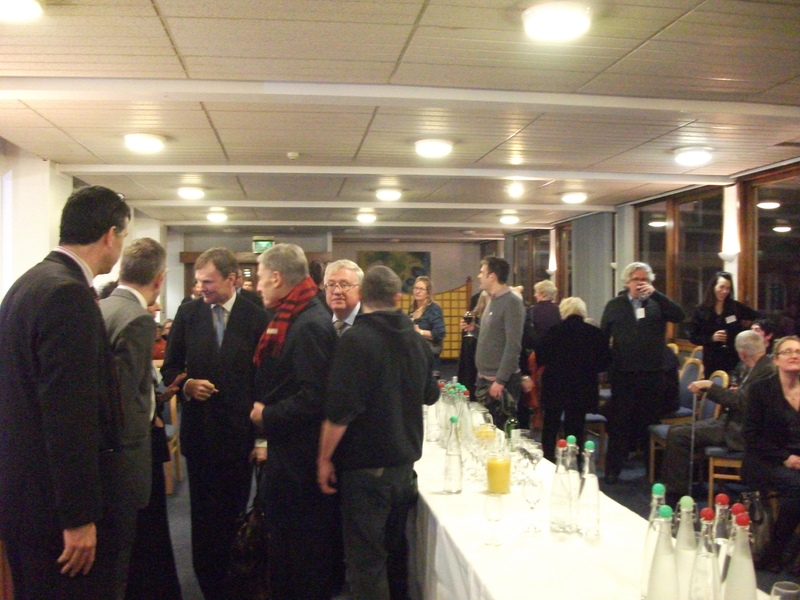 For once, students, alumni and staff actually talked together about their thoughts on the future for education. 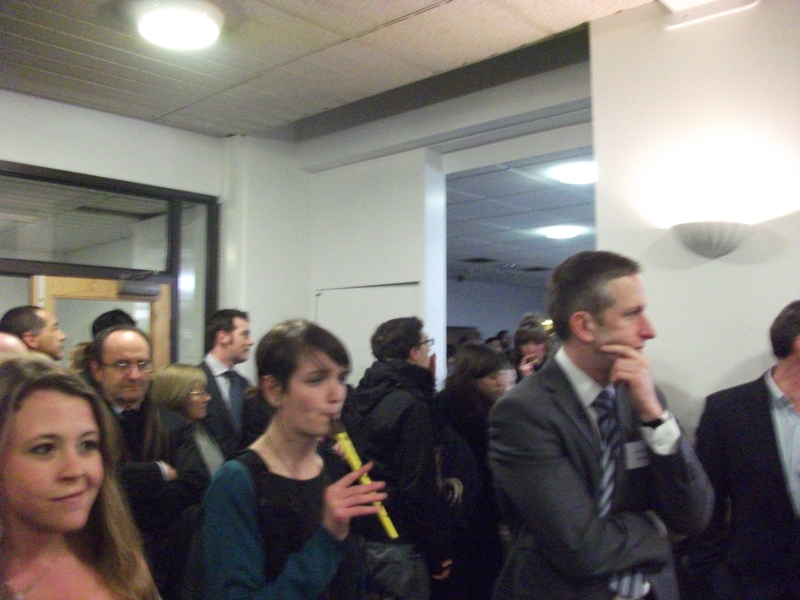 A few of us were caught into discussing with an Education editor from Channel 4. Apparently a former alumni and perhaps a nice man in other circumstances, his thinking on the matter was inflexible and in the typical journalist cliche continually repeated his reductive understanding of the facts in order to cover up his ignorance of 20th and 21st century economics and the politics of higher education. 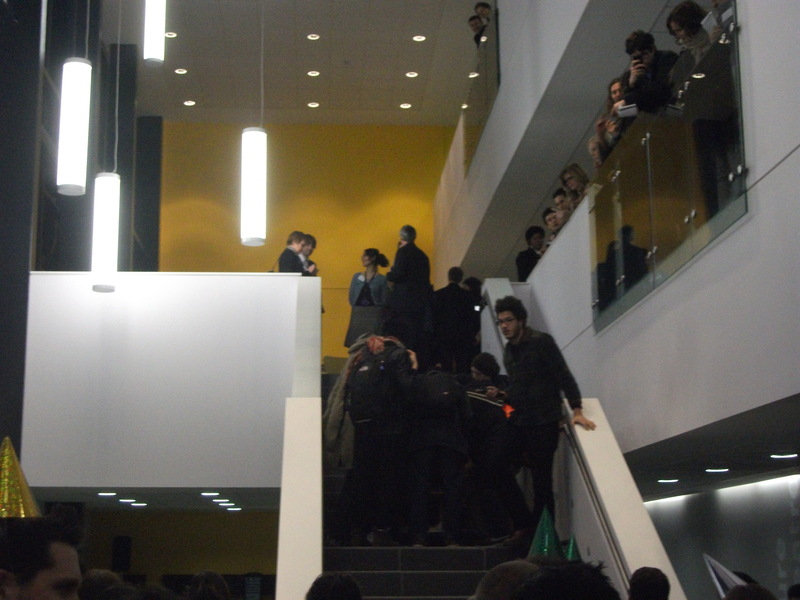 Maybe around 200 students or so peacefully intervened into the discussion of the New Academic direction. One student lacks the financial means to even afford enough batteries to provide for flash photography, resulting in slightly surreal images like this. Goldsmiths provided their very own brand of bottled water. A harried woman from Estates later tried to take back a bottle from some of the protesters, charging £2.50 for the privilege when we in fact had spent nearly tens of thousands on our education, just as our forebears were likely to spend more. The party moved back to the cool sounds of the NAB. A pleasant view of London from the 3rd floor. Archie Norman later attempted to come across as sincere and interested by taking questions outside the NAB. Students queued up to quiz him on his hypocritical stances on low wages, internships, tax evasion of the wealthy and the role of millionaires in propagating capitalist misery. Though clearly a pleasant and friendly man, he was a product of his situation, and he celebrated the free market whilst not reflecting on its dangerous application and implications for independent higher education institutions like Goldsmiths. Some people did get too carried away and one decided to throw water at him, an absolutely stupid thing to do and completely out of sync with most people’s polite and peaceful demonstrations. 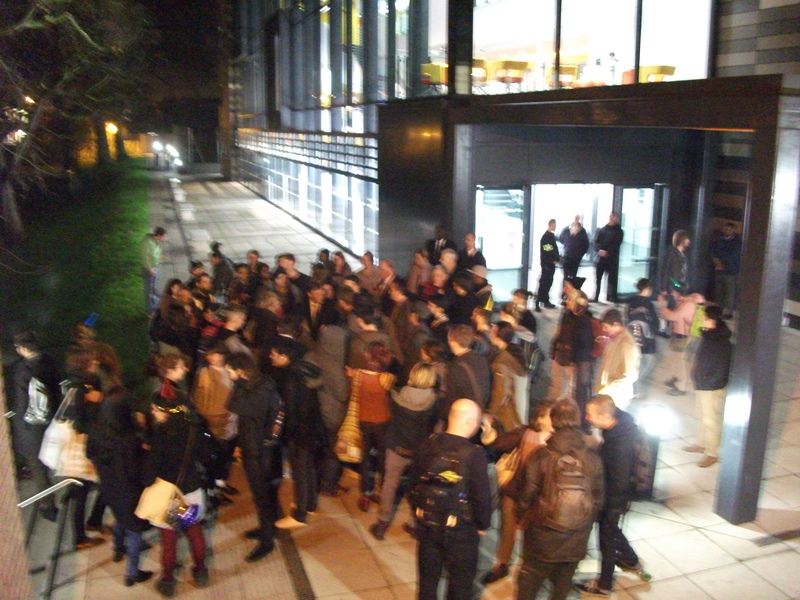 The college staff later tried to tarnish the entire peaceful protest with the rare outbreaks of stupidity largely by non-Goldsmiths people. It is about time someone chronicle these views instead of the decline of London into a plutocracy of the poor, the punished, the pessimists and the passive. Much of the event had the feeling of a Smiths single video, but as much as the heart’s mother tongue is composed of that stuff, I sense we’re beyond middle-class revolt now. But there is a light that never fades sister. Find out how they’re bleeding your local educational institution if you’re with one, and if not, what they did to yours…. Posted on February 23, 2011 July 22, 2011 by JD Taylor	This entry was posted in Political. Bookmark the permalink. Indeed, according to the Evening Standard, Archie’s response was one of perplexity – ‘I’m surprised they think I’m worth attention.’ Deliberate ignorance and press bias aside, it may be true that the message is lacking some coherence.